'Today I am impressed by seeing the military unit. 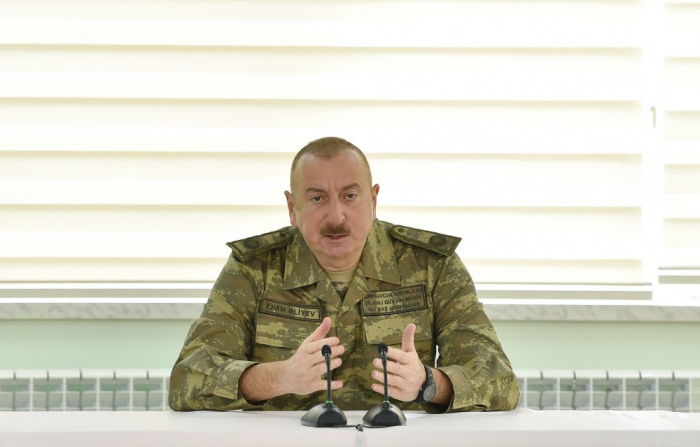 Recently, the military unit has been reconstructed and all necessary conditions have been created for the military exercises,' Commander-in-Chief Ilham Aliyev said during his visit to a military unit of the Special Forces of the Defense Ministry, on April 2., AzVision.az reports. 'Today Azerbaijani army develops. The army is modernized, reconstructed, equipped with newest weaponry. Since Azerbaijan is in a state of war, the first stage of war has not ended yet. Today Azerbaijani army is among most powerful armies of the world. Three years pass since April battles. The April battles are our glorious history. We did have martyrs. May Allah rest their souls in peace. Soldiers and officers wounded in the April 2016 battles have been provided with necessary medical treatment. Fortunately, they have returned to a normal lifestyle. We have taken all necessary measures to return them to active lifestyle,' the head of state noted. 'April battles are our great historical victory. It is one of the most successful military operations in our modern history. Until the battles, all the frontier positions and settlements of Azerbaijan were subjected to heavy fire by the Armenian Armed Forces. In order to suppress the Armenian provocation, ensure safety of the civilian population, the Azerbaijani Armed Forces command made a decision to take urgent response measures in the Aghdere-Tartar-Aghdam and Khojavand-Fuzuli directions. As a result of the successful counteroffensive, more than 2,000 hectares of territory were liberated from the Armenian occupation, even a larger territory came under the control of the Azerbaijani army. Azerbaijani Armed Forces have fortified the liberated lands. Today, the Azerbaijani flag waves over the occupied territories of Agdere, Fuzuli and Jabrail regions,' President Aliyev added. 'Military servicemen demonstrated both military professionalism and heroism during the April battles. Azerbaijani army once again showed that Azerbaijani soldier is dedicated to his profession. April battles were very successful military operation. After a counteroffensive operation launched from an unfavorable position, our army took over strategic positions. Besides, those battles were of utmost importance morally and psychologically. Throughout the years, Armenia has created the myth that Armenian military is ahead of Azerbaijan. April battles showed that the Azerbaijani army has high potential and can do any task at any time. The myth created by Armenia has been dispelled,' Commander-in-Chief Ilham Aliyev stated.